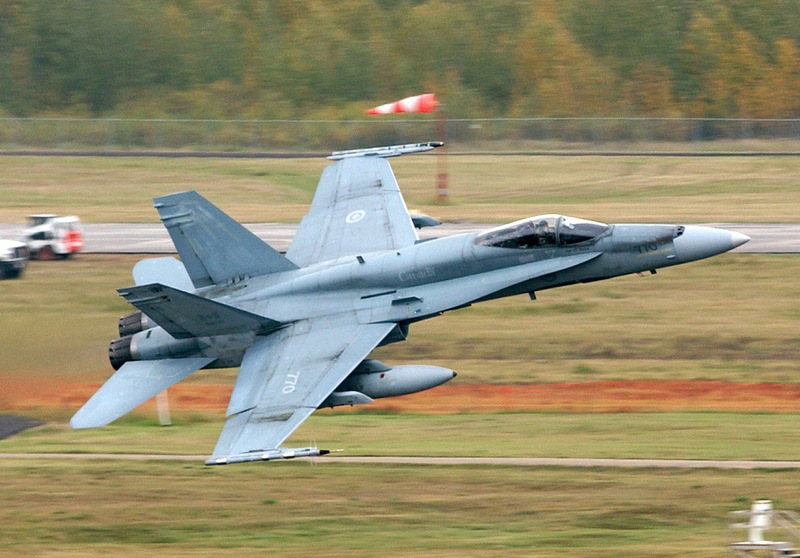 A Royal Canadian Air Force (RCAF) CF-18 Hornet, 4-Wing, takes off from Cold Lake, Alberta, Canada during the second Tiger Meet of the Americas. The Hornet is carrying two types of Air Combat Maneuvering Instrumentation (ACMI) pods on the wing tips. The Tiger Meet of the Americas, first ever held in Canada, inaugurated in 2001 in the Western Hemisphere to carry on the Tiger tradition of the long-established European original experience; promoting solidarity and operational understanding between NATO members. The Meet attracted 400 participants and over 20 aircraft, with at least 6 fighter jets painted in distinctive "Tiger" schemes. For a squadron to be invited, only one simple criterion required, the unit must have a Tiger or other big cat on their unit's insignia or as a mascot. Photo by SMSGT JOHN P. ROHRER, USAF.